Like many organisations that rely on public funding, the recent, big event for the NDA has been the long-awaited 2015 Spending Review announcements. This 2015 settlement continues the long-term programme of investment in dealing with the UK’s nuclear legacy, inherited by the NDA in 2005 but which dates back to the 1940’s. 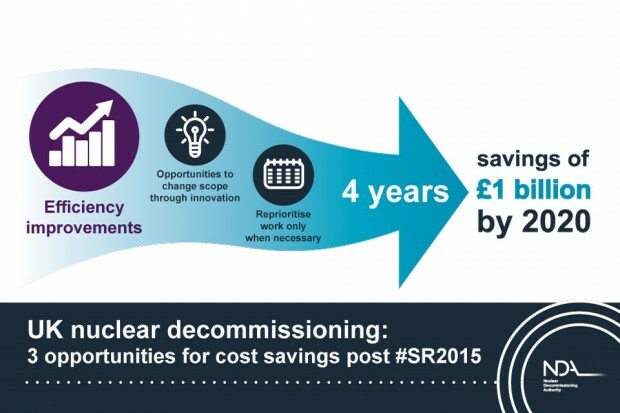 We very much welcome the government’s continued focus on safe, secure nuclear operations and decommissioning. In broad terms, the chancellor announced £11 billion of grant funding for NDA over the next 5 years which, together with our projected income in that period of approximately £5 billion, means we can continue to make broad progress across our nuclear estate. However, we have also been challenged to deliver £1 billion of savings through various mechanisms by 2020. To achieve this, we and our Site Licence Companies will need to place even greater focus on efficiencies and value for money. The Innovation Zone at this year’s NDA Supply Chain event showed off many of the latest advances that are helping to deliver quicker, safer, or cheaper ways to tackle the challenges we face. We aim to stimulate and support this level of innovation through collaboration between the SLCs, the supply chain, academia, ourselves and various funding bodies. You might recall that a recent breakthrough in the management of nuclear waste is set to accelerate progress at Sellafield will save hundreds of millions of pounds. So we must continue to make progress and support our supply chain which is critical in helping us achieve our mission. We are publishing more details on the implications of the spending review settlement in our draft business plan and draft strategy documents. Both documents will be published for consultation on 5 January 2016, later than originally planned so the final drafts take account of the spending review. You will have 6 weeks (until 15 February) to take and look at the proposed strategy and plans. Please do send us your comments and views. We welcome your thoughts, so please engage in the consultation. To keep up to date with our work sign up to receive our regular e-bulletin or share your supply chain news in our NDA estate supply chain networking group via LinkedIn. You can also sign up to receive updates via this blog on the right. £11bn grant over 5 years plus £5bn income gives a very healthy £16bn budget to play with. Now that GE Hitachi have put a price on PRISM of £4bn, might the decision to select PRISM as the option for the disposition of the UK's plutonium stockpile look to be a very sound investment? To an ill-informed outsider like me, it looks to be a no-brainer decision and a particular 'easy sell' to Parliament as a more than worthwhile contribution, since it is a low-carbon source of electricity, to meeting our mandatory carbon targets. You may not have done the sums, but this one modest nuclear power plant on its site up in Sellafield - no bigger then that of a large supermarket - would make the same contribution to meeting our carbon targets as 2,364 x 2 MW wind turbines and they'd cost about £10.7bn. Also, it doesn't take much imagination to believe that this reactor, operating at near atmospheric pressure and made from stainless steel, could be manufactured in its entirety in the UK. We certainly have the nuclear expertise, manufacturing capacity and supply chain to give UK nuclear engineering a boost we have not seen in 1 or 2 generations. The NDA is in the process of submitting advice to support the Department of Energy and Climate Change (DECC) in its considerations concerning the UK plutonium stock. This, together with other sources of information and evidence, will enable DECC to consider options for the way forward. A decision will be made by ministers in due course on how to proceed. NDA intend to publish a public position paper in due course summarising the outcome of the latest phase of work. Only when the Government is confident that its preferred option could be implemented safely and securely, that it is affordable, deliverable, and offers value for money, will it be in a position to proceed.